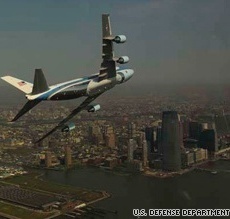 2009: A Boeing VC-25 (a military version of a 747) and an F-16 fighter fly frighteningly close to the Manhattan skyline during a government-sanctioned photo shoot. The unannounced flyby causes panic in lower Manhattan, as workers and residents in both New York and New Jersey flash back to the 9-11 terrorist attacks and rush to evacuate buildings. “I'm annoyed—furious is a better word—that I wasn't told,” said New York Mayor Michael Bloomberg. “Why the Defense Department wanted to do a photo op right around the site of the World Trade Center defies the imagination,” he said. The Air Force estimates that the photo shoot cost taxpayers $328,835. 2009: The New Orleans Hornets lose a first-round NBA playoff game to the Denver Nuggets 121-63. The 58-point margin of defeat ties the all-time record for most lopsided loss in NBA playoff history, matching a 133-75 Minneapolis Lakers victory over the St. Louis Hawks in 1956. 2007: During the bottom of the sixth inning of a major league baseball game between the Baltimore Orioles and Cleveland Indians at Progressive Field in Cleveland, umpire Ed Montague credits the Orioles with a run his crew had mistakenly waved off three-and-a-half innings earlier. “Only in Cleveland could the Indians go from a tie game to being a run behind—while they were batting,” quips a Cleveland sports columnist after the fact. The Orioles go on to win the game 7-4. 1982: The Tampa Bay Buccaneers accidentally select Sean Farrell (OG, Penn State) with their first round pick in the NFL draft after the team's representative turns in the wrong card to the NFL. To select their intended target, Booker Reese, a defensive end out of Bethune-Cookman, the Bucs acquire an early second-round pick from the Chicago Bears in exchange for their first-round pick in 1983. Ironically, Tampa Bay's “mistake” selection goes on to have a solid, albeit unspectacular NFL career, while Reese turns out to be a bust. 1865: The worst maritime disaster in U.S. history occurs when the steamboat Sultana explodes and sinks on a flood-stage Mississippi River, killing 1,700 passengers. Almost all of the men killed are Union Civil War veterans, ex-prisoners of war attempting to return to their homes.